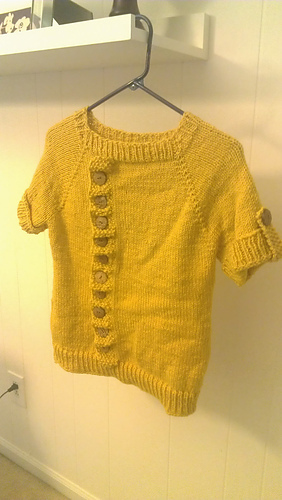 If you love the look of cardigans but despise all the purling, this pattern may be for you. 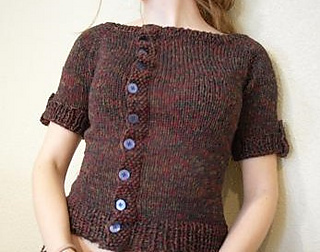 This is a simple faux button-up top knitted entirely seamlessly in the round. Top can easily be adjusted to add faux button-up panel in the center or on the side of front. Top can also be easily adjusted with a sweater generator pattern to fit your measurements exactly. I designed the top to show off the interesting color arrangements of Yarnia yarn, but any type of yarn can be used. This pattern is a good mindless knit, perfect for your travelling project or for beginners.<p>This pattern has been recently added, if you find any flaws, or can suggest a way to make it more user-friendly, please do not hesitate to let me know! !